It may seem like a rather daunting prospect to change your diet to one that is healthful. However, the truth is that small changes can make a big difference too. Add more heart-healthy fats to your diet – Although many people automatically assume that they must cut fat from their diet, the fact of the matter is that there is a huge difference between bad fats and good fats. Luckily, there are a number of heart-healthy fats that you can begin incorporating into your diet, including olive oil, canola oil, nuts, seeds and avocados. Heart-healthy fats are important for your body’s metabolism and will help your body perform better and stave off hunger. 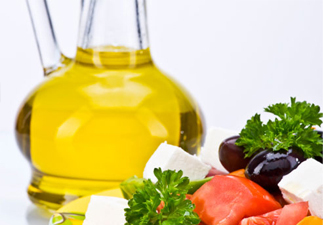 A good way to begin incorporating heart-healthy fats into your diet is to cook with olive oil or canola oil. Reduce your intake of soda – There is no better way to sabotage your diet than with soda. Regular soda is laden with sugar and calories, while diet soda is thought to increase your desire for high-calorie and sugary foods and zap your energy. One of the best choices you can make when it comes to your diet is to drink more water. Another good option is green tea. Water hydrates the body, helps to flush toxins from the body, improve your body’s bowel habits and fight off viruses. Instead of drinking a set number of glasses of water each day, simply begin replacing other types of drinks with water. You may soon find that your waist line will thank you for it! Add more whole grains to your diet – Simply replacing simple, processed grains with their whole grain counterparts will provide your body with essential B vitamins and fiber, both of which are crucial to a good immune system. By switching out white potatoes, bread and rice with a whole-grain alternative you can begin making positive changes to your diet. Some options when it comes to whole grains include: millet, barley, buckwheat, wild rice, whole grain breads and quinoa. Eat breakfast – If you incorporate breakfast into your diet every morning, you are less likely to overeat during the day. It stabilizes your blood sugar, staves off hunger and provides you with the energy you need to get you through the day. From better concentration to less fatigue, eating breakfast has a plethora of benefits for both the body and the mind. If you are having a hard time sticking to your diet, a breakfast rich in protein and whole grains is a great way to switch things up. Avoid eating simple carbs, though, as they will cause a spike in hunger because of a drop in blood sugar after just a few hours. You don’t have to perform a major overhaul of your diet to see results. You can just begin to implement small changes to improve your health and lose weight too.